wedding or corporate event providing delicious Chinese Food in banquet or noodle box format. Our menu is diverse and cost-effective and we can tailor our offer to fit your style & budget perfectly. 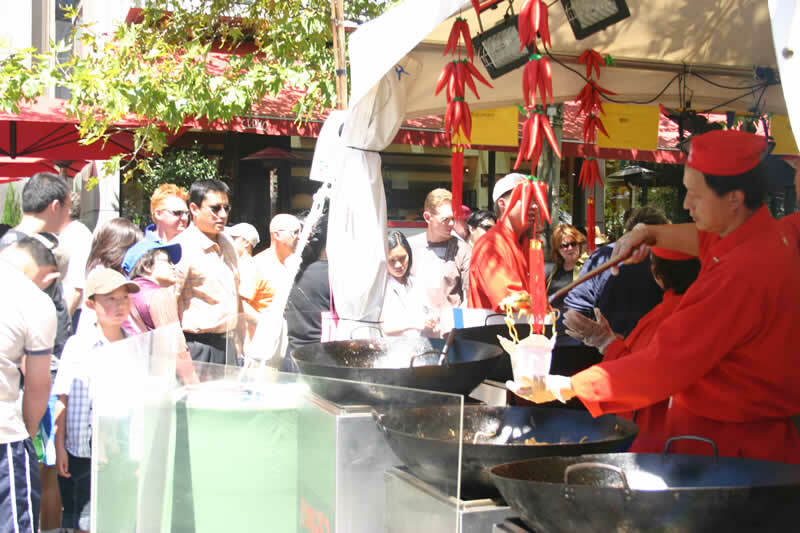 Whether it be a Sunday Yum Cha for 25 guests or a work function or wedding for hundreds of people, Flying Woks will create a successful memorable event for you. full printable menu is here. Please don't hesitate to call or email, tell us about your upcoming function and we will happily suggest some fantastic options for you. Marinated Beef strips tossed with dry roasted Szechwan pepper and seasonal vegetables & hokkien noodles. Garlic, ginger, coriander, seasonal vegetables & authentic Hong Kong satay served best with rice noodles. Ripe bananas are deep fried in tapioca batter and rolled in cinnamon & shredded coconut.